Data Loss Prevention systems are an extremely powerful means of protecting information, but they are only as good as their ability to understand and identify restricted data. 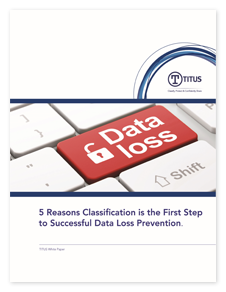 Discover the five reasons why data classification is an essential first step to achieving the maximum return on investment for any DLP implementation. By identifying and classifying information first, DLP systems can run more efficiently, and even difficult to identify data, such as multimedia files or intellectual property, is easily protected.